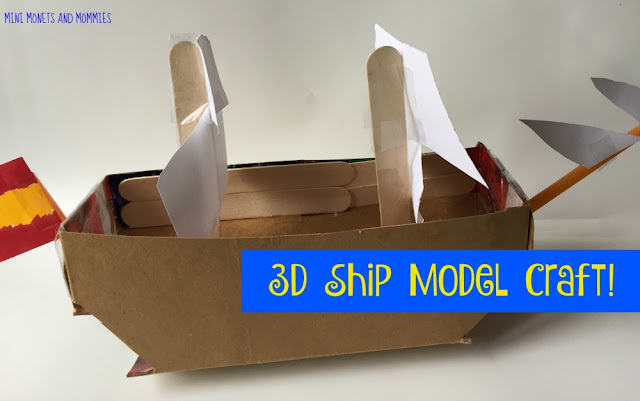 When my son came home from school telling me that he had to build a 3D boat model for social studies class I have to admit I was a bit giddy. Why? Because he’s 14-years-old now and anything having to do with art or crafting is apparently majorly uncool in his teenage brain. After spending the last decade or so teaching children’s art programs it sometimes pains me that my son is so uninterested in anything having to do with art. I miss those days when he’d come to work with me, look at artwork on view at the museum and actually enjoy all of the painting, gluing and clay play that we did. But, not every child enjoys art – and so I let it go. As you can imagine, getting to spend a Sunday afternoon with my Xbox-playing teen doing anything that involved art was super-fun for me. Even though he’d never admit it, I know he had fun too! So, here’s the art-making. His goal: To make a ship. Our materials: Reused paper products (mostly). 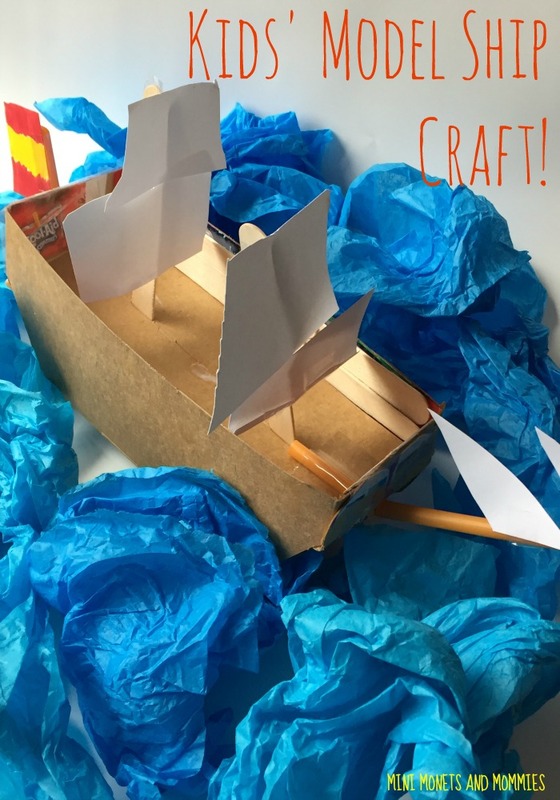 You don’t have to have a teen to make this kids’ ship craft. It’s not difficult, and you can easily adapt it to other ages. · Two cardboard juice pouch boxes – We chose these boxes because they are the perfect shape and have ready-made folds and perforations that are just-right. 1. Open one of the boxes and flatten it on your work surface. 2. Draw the ship shape onto the top panel. Make the bottom of the boat the fold. 3. Flip the cardboard around (not over) and draw the ship shape again on what is now the new top panel. 4. Cut out the drawing. You’ll need to leave the top and bottom ship shapes connected by what was the bottom of the box. When your child gets to the sides he can cut tabs in the cardboard. 5. Fold the ship. Basically, your child is just reassembling the box (but, inside out). 6. Tape the tabs together on the sides. 7. Make a second layer to use as the ship’s deck. Cut the bottom of the other box out. Because the boxes are the same size, if your child cuts the cardboard slightly thinner it will fit perfectly. Leave the sides attached to make tabs. 8. Push the deck into the boat. Wrap the tabs around the sides of the boat (the first tabs that your child taped). Tape them together. 9. Cut sails from the card stock paper. Tape them to craft sticks (we made two). 10. Push the craft sticks through the deck’s cardboard. The boxes that we used had perfectly sized perforations. If yours doesn’t, use the scissors to make slits. Your child can also glue a few left over craft sticks to the sides of the boat. 11. Tape the straw to the front of the boat (you can also add one at the back too). Cut the straw a few inches down. Bend it and tape the bendy part under the ship’s deck. 12. Add flags and sails to the straw to complete the 3D boat model!